Canada confirmed a case of mad cow disease on Sunday at a farm in British Columbia — the country's fifth case since May 2003. However, no part of the animal entered the human food or animal feed systems, so it will have no bearing on the safety of Canadian beef, the Canadian Food Inspection Agency said in a statement. The Canadian Food Inspection Agency announced Thursday it had a suspected case of bovine spongiform encephalopathy, or BSE. In humans, meat products contaminated with BSE has been linked to more than 150 deaths, mostly in Britain, from variant Creutzfeldt-Jakob Disease, a rare and fatal nerve disease. The cow was identified on a Fraser Valley farm through the national BSE surveillance program. It is fifth case in Canada since May 2003, when the U.S. border was closed to Canadian beef after the sick cows were detected in Canada. Inspectors have tested roughly 100,000 animals since Canada's first case was detected in Alberta and have said they expect to find isolated cases of the disease. It is second animal born after a 1997 ban on cattle feed to test positive for mad cow. 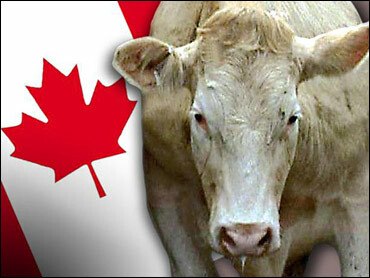 A cow from an Alberta farm tested positive for the disease in January.